Thyme for Cooking Dinner tonight: Pork Tenderloin with Brussels Sprouts. This is simply the result of being lazy... And avoiding an extra pan. I was quite happy with the results and have added it to the cookbook. Pork tenderloin cooks very fast when sliced and stays much more tender than chops. 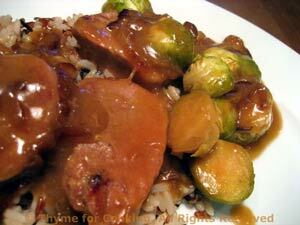 Sliced pork tenderloin and Brussels sprouts cooked together in a brown sugar and hot mustard sauce. 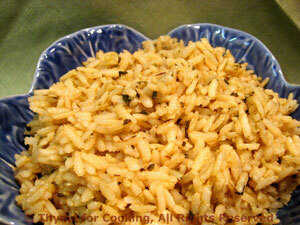 Serve over brown rice for a healthy, one-dish dinner. Slice tenderloin into 1" (2.5cm) thick rounds. Move onions to the side of the skillet and add pork. Brown about 2 minutes per side. Trim Brussels sprouts: slice a bit off of the stem end and peel away the outer leaves - any that are damaged, wilted or discolored. Cut in half. Lay the Brussels sprouts around the pork, cut side down. Simmer until sprouts are fork tender, about 10 minutes longer. Dissolve cornstarch in water. Move pork to the side, stir in cornstarch mixture, stirring until thickened. Serve.